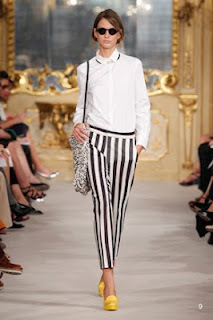 Take a fierce strut this summer in the hottest print of 2013; the striped pant. My boyfriend jokingly calls me Beatle Juice when I rock mine but it’s the must have for the season. The black stripes running vertically from the waist come in jean or jegging style and are super sliming and can go from day look to evening glam by adding a hot colourful heel. Pairing with a cute tank or fitted jacket has been a hit on runways and red carpets in Hollywood. So many brands have brought in the pants including Guess, Topshop, H&M, Louis Vuitton, The Bay, Express and so many others. Not only are they super adorbs but they’re also available for such a low price at the stores below. Get the must have of the season.